Based on recent research the ATSB now states that there the missing Malaysia Airlines Boeing 777, flight MH370, could be found in an unsearched area between latitudes 33°S and 36°S along the 7th arc of approximately 25,000 km². The Australian Transport Safety Bureau (ATSB) released its report MH370 – First Principles Review and a supporting report by the Commonwealth Scientific and Industrial Research Organisation (CSIRO): The search for MH370 and ocean surface drift. The First Principles Review report summarises the outcomes of a meeting conducted in November and attended by Australian and international experts in data processing, satellite communications, accident investigation, aircraft performance, flight operations, sonar data, acoustic data and oceanography. The purpose of the First Principles Review was to reassess and validate existing evidence and to consider any new analysis that may assist in identifying the location of MH370. The CSIRO report was commissioned by the ATSB earlier in 2016 and was considered by the experts attending the First Principles Review. The experts confirmed their agreement that the analysis of the last two SATCOM transmissions, the likely housed position of the main flaps at impact, and results from the recent flight simulations indicate with high probability that the aircraft lies within 25 NM of the 7th arc that had been derived from analysis of the last satellite communications with the aircraft. Given the high confidence in the search undertaken to date, the experts agreed that the previously defined indicative underwater area is unlikely to contain the missing aircraft between latitudes 36°S and 39.3°S along the 7th arc. 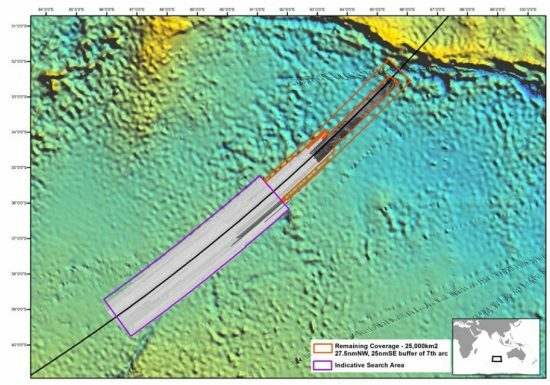 The experts also agreed that CSIRO’s debris drift modelling results present strong evidence that the aircraft is most likely to be located to the north of the current indicative underwater search area. When considered together with updated flight path modelling, the experts concluded that an unsearched area between latitudes 33°S and 36°S along the 7th arc of approximately 25,000 km², has the highest probability of containing the wreckage of the aircraft. Given the international protocols for aircraft recovery scenarios such as this, Malaysia will continue to take the central role in the determination of any future course of action in the search for MH370.